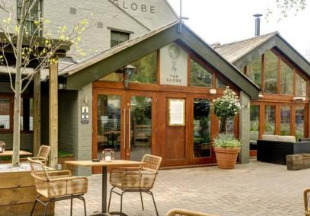 Luxurious The Globe is located in the centre of Wawick and features a steak house, real ale bar and stylish rooms with free Wi-Fi. Also features a terrace for alfresco dining. This traditional 400 year old inn is situated close to the town centre, just a 10 minute walk from Warwick Castle. Many of the rooms boast original 17th century features as well as all the modern conveniences expected today. Enjoy great food, real ales and fine wine in historic surroundings. 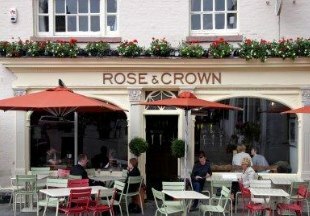 Voted 'Best Pub in the UK' in 2004, the Rose and Crown is an historic coaching inn perfectly situated in the market place in the centre of Warwick, within walking distance of Warwick Castle. The 13 comfortable and stylish rooms include five in the inn itself, and eight rooms new for 2013 in the 17th century building just across from the inn. Our friendly gastro pub serves great food and drink all day long. 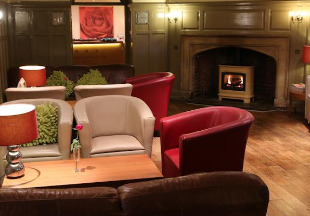 The Warwick Arms enjoys a great city centre location and boasts free private parking for guests. Within walking distance of Warwick Castle, the historic exterior of the Warwick Arms belies its comfortable yet contemporary interior. The hotel offers a choice of formal and informal dining, including a new feature bar in the conservatory area. We are renowned for our traditional Sunday roasts! 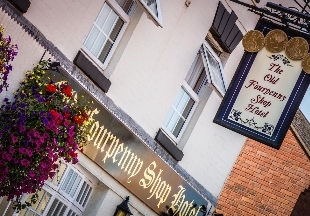 In the heart of Warwick and near to all its attractions including Warwick Castle is The Old Fourpenny Hotel. 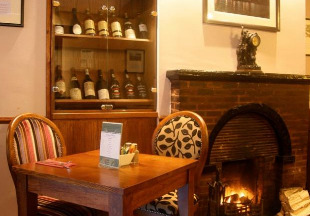 Alongside comfortable bedrooms the pub below offers a wide selection of real ale, craft lagers, ciders and fine wines and a menu comprised of locally sourced and seasonal dishes. Claiming its position on Market Place in the centre of Warwick since the 17th century. 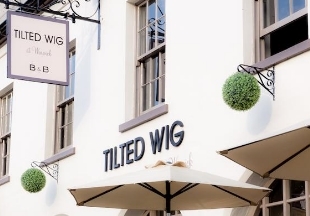 The Tilted Wig provides recently refurbished bedrooms alongside an attractive bar and restaurant. Within easy walking distance from Warwick Castle, Priory Park and Warwick Racecourse. This 19th century coffee tavern in the centre of Warwick retains many original featured yet has been tastefully restored to provide all comforts that the modern-day traveller expects. Alongside boutique-styled bedrooms, The Old Coffee Tavern offers real ales and craft beer alongside a locally sourced menu. One of the oldest hotels in Warwick, the wonderful half-timbered exterior of the 15th century Tudor House Hotel really stands out. Situated just across the road from Warwick Castle, you couldn't want for a better location. The authentic oak beams give the bar and restaurant a real Tudor feel. Here you can enjoy excellent food, real ales and a welcoming pub atmosphere. 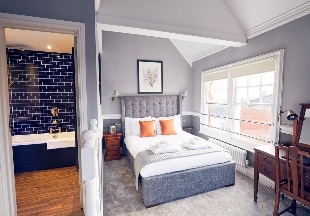 Set in the heart of England just a short distance from Shakespeare’s Stratford, historic Warwick and romantic Kenilworth Castle, the Glebe at Barford has 39 individually decorated bedrooms, fine cuisine and leisure facilities. Relax in the spacious lounge bar with its marble floor or soak away the tensions of the day in the spa pool before dining in the conservatory restaurant which overlooks the gardens. Located just one mile from M40 Junction 15. 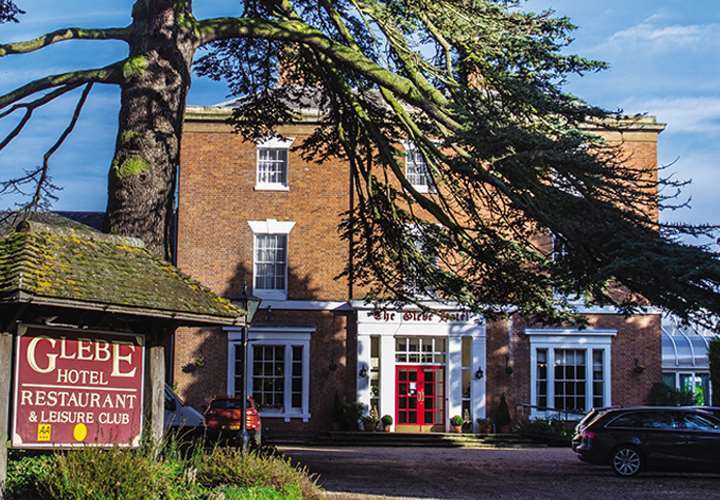 Welcome to our handpicked selection of historic hotels and inns in Warwick. Warwick is the county town of Warwickshire and famous for its magnificent castle. The original Warwick Castle was built by William the Conqueror; the impressive stone castle we see today was built in the 12th century. It is everyone's idea of a 'proper' English castle; turrets, moat, dungeons and towers. The themed displays are stunning, and there are events throughout the year. And Warwick itself is a picturesque town, with plenty to see and do. There are the pretty riverside gardens, attractive period buildings, excellent museums, friendly pubs, inns and cafes, and a great variety of shops. "Warwick is steeped in history so why not indulge in all things historical and stay in an ancient inn! 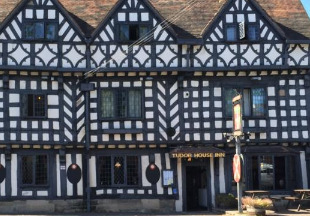 The Tudor House Inn simply oozes character with its heavy oak beams, and the 400 year old Kings Head Inn still retains many original features."